Amazing 9BR, 8.5BA, LAKE VIEWS, Chef's Kitchen, Hot Tub, Near Heavenly! "Stunning!"... "Spectacular!" ... "Incredibly Well-Equipped"... "Amazing Property in Great Location"... "Outstanding Hospitality..."
This stunning home with sweeping views features 9 bedrooms and 8.5 baths. Your group will be especially thrilled with the fully-stocked gourmet kitchen, private setting, and super comfortable beds, which is why this home has earned 70 FIVE STAR REVIEWS. This 5-Star rated home is ideally located only 1 mile to the Heavenly Ski Gondola, Lake Beaches, shopping, Casino entertainment and Edgewood Golf Resort. It's the best of both worlds, a great spot for nature lovers yet near to most local attractions. This beautiful home is surrounded by nature and hiking trails and ideally located 1 mile to the Ski Gondola, Lake Beaches, Shopping, and Casino entertainment. The size, views, setting, privacy, and amenities, are very unique to this area. We are NOT a property management company or absentee owners. So we are able to focus on the small details that add up to an unparalleled difference in the quality of our guest's experience. 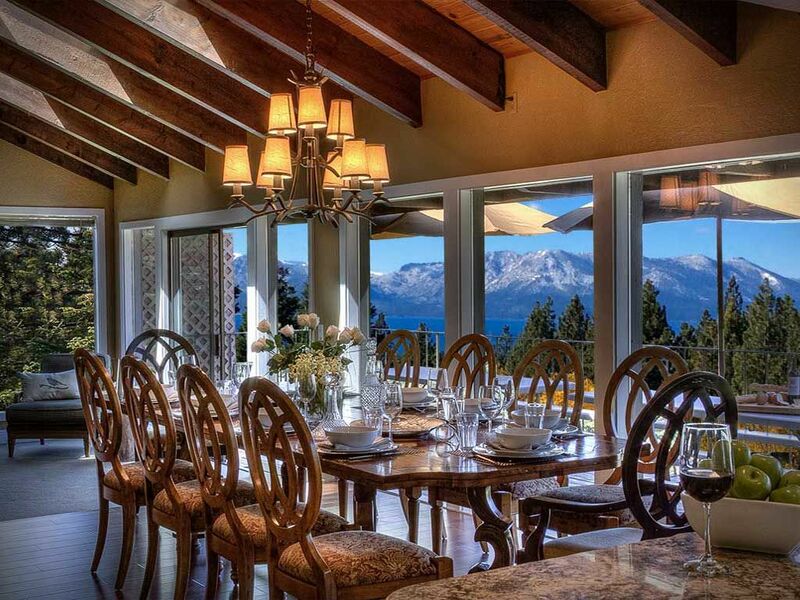 Yes, one of the rare homes in Tahoe with Air conditioning! Parking for 5 vehicles with over-flow off-street parking for 3 more. The best 2 car garage you've ever seen!